If you work on your computer, then you need some sort of systematic backup. Disasters happen and can take many forms. There are natural disasters such as floods, tornadoes, earthquakes and hurricanes and then there are the computer generated disasters such as hard drive failures which can destroy your data and your business records as well. When it comes to backing up your information, I'm a HUGE fan of what is known as "redundant backups". That means, I use more than one method of protecting and backing up my data. Backing up your data can mean simply burning a CD or DVD with a copy of essential files. Backing essential files up can also be done with a flash or jump drive. Do this in addition to whatever else you choose and you can point with pride to your "redundant" backup system. 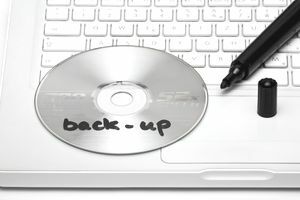 Before setting up your backup plan, ask yourself if you need to back up data or if you need to back up your computer. There's a HUGE difference between those two. Most online automatic backup storage services will only back up the hard data on your computer. Data doesn't include the software used to create the file but only covers the file itself. So, if you created a dozen documents in Microsoft Word, then most automatic online backups would "back up" those 12 documents. However, its important to note that these online backup services will NOT backup your software. If disaster strikes, you'll need to install Word once again to be able to open those 12 files. If you only have 1 or 2 software programs installed on your computer, then an automatic online backup system may be all you need. IMPORTANT NOTE: Email files are not included as data and are usually not part of the backup data files!!!! If you need more than just your data backed up, then you need to begin looking at other backup options. One surprisingly affordable solution is to purchase an external hard drive and combine that with a backup recovery system. Using this 1-2 combination provides you with an easy and effective way of "restoring" your computer should disaster strike. Unlike previous desktop versions that would "ghost" your hard drive, the Symantec Backup Exec software is much easier to use and has the added advantage of being "automatic". Now for a word about redundancy... again! Let's say tomorrow when you come into your office, you hit the button to turn on your computer and you're greeted with what is known as the "blue screen of death". If that happens, you'll be VERY happy that your external drive is sitting right next to your CPU with all your data backed up on it. However, if you enter your office tomorrow and find your desk under water... you will be wishing your external hard drive wasn't floating right next to your computer's CPU. At that point in time, you will realize that DVDs you made as redundant backups which are floating nearby may or may not be salvageable. At a time like that, you'll wish your data was safe and sound off site as the result of an automatic online backup. So when it comes to backing up your data, pick more than one way to preserve your data. Do some exploring to find (1) an external hard drive, which you can keep offsite, and (2) an online application as a "ghost" computer.